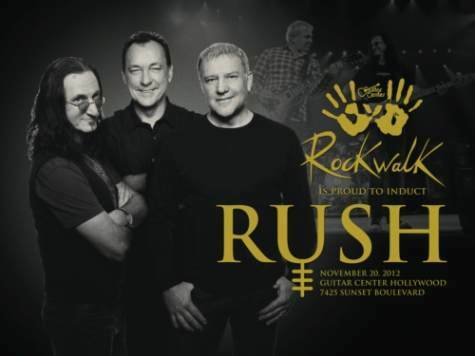 On November 20, 2012, radio personality Jim Ladd introduced Rush, to fans and press, as they were inducted into the historic Guitar Center RockWalk. Geddy Lee, Neil Peart and Alex Lifeson placed their hand prints onto the wet cement which was later placed next to the palms and faces of other legendary musicians in front of the world famous Guitar Center Hollywood on Sunset Blvd. Guitar Center has just released a video highlights package from the event.